Housed in a graffitied 40ft shipping container, The Aftermath Dislocation Principle (or the #AdpRiotTour) is a miniature world full of irreverent, post-apocalyptic scenes created by artist Jimmy Cauty (from 90s duo The KLF). This artwork was originally part of Banksy’s Dismaland Experience in Weston-super-Mare in 2015 and was shown at the Royal Academy in London this summer. This unorthodox artwork will be outside B&M Bargains in Macclesfield from Tuesday 15th to Monday 21st November to continue the town’s cultural revolution. The container is internally lit from 11am-7pm so visitors can view the interior townscape through the peep holes all around. 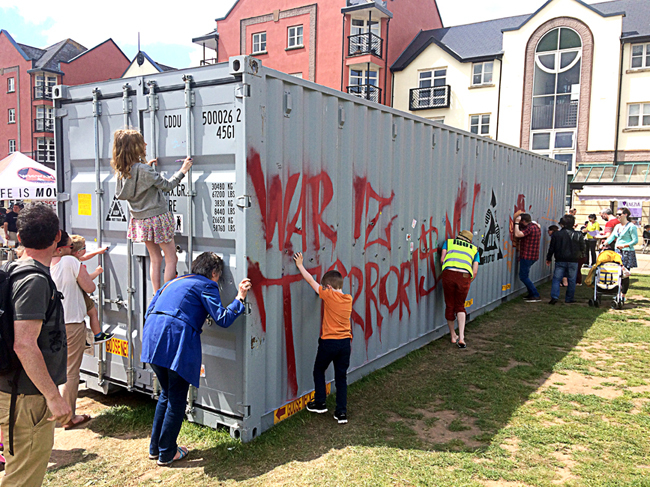 There will also be free, anarchic activities and happenings by local artists on the square alongside the container. Following the launch activities at 6:30pm on Tuesday, these are mainly on Wednesday 16th ( 2 pm till 4pm ) and Saturday 19th ( 11am till 7pm ) however in the way that it does, anarchy is prone to dislike timetables and may pop up in Exchange Square at any time during the #AdpRiotTour visit to Macclesfield. Look out for music, riotous poetry, symbol painting and placard workshops. Join in with street games, choral poetry and a 90’s Rave. Take the opportunity to improve an “old master”, modify the outside of the container and experience street performances. On a more serious note, consider the causes of riots: respond poetically adding to our #AdpRiotTour poem or practically by helping to build a food barrier to be donated to our local food bank.